The Terriers were relegated with six games to go, matching Derby’s record, and Fulham were not far behind as defeat to Watford on Tuesday condemned them. Here, Press Association Sport takes a look at both clubs’ performance using ‘expected goals’ data from StatsBomb. 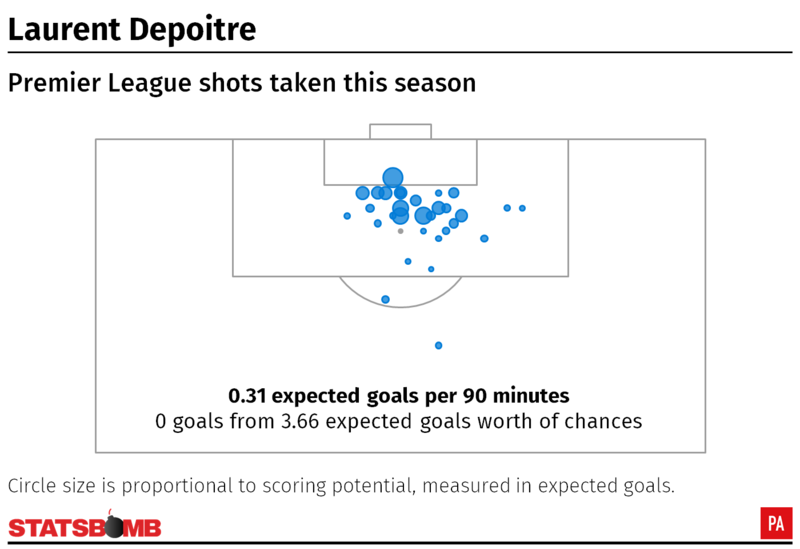 Expected goals (xG) seeks to assess the likelihood of a player or team scoring from the chances that come their way, based on an assessment of similar shots in past games. The graphic above shows a team’s expected goals scored on the horizontal axis, on a per-match basis, from the least effective attacks on the left to the most dangerous on the right. The vertical axis shows xG against, also in escalating order, so the league’s strongest teams are found in the bottom right corner of the graph – with Huddersfield and Fulham unsurprisingly in the top left. 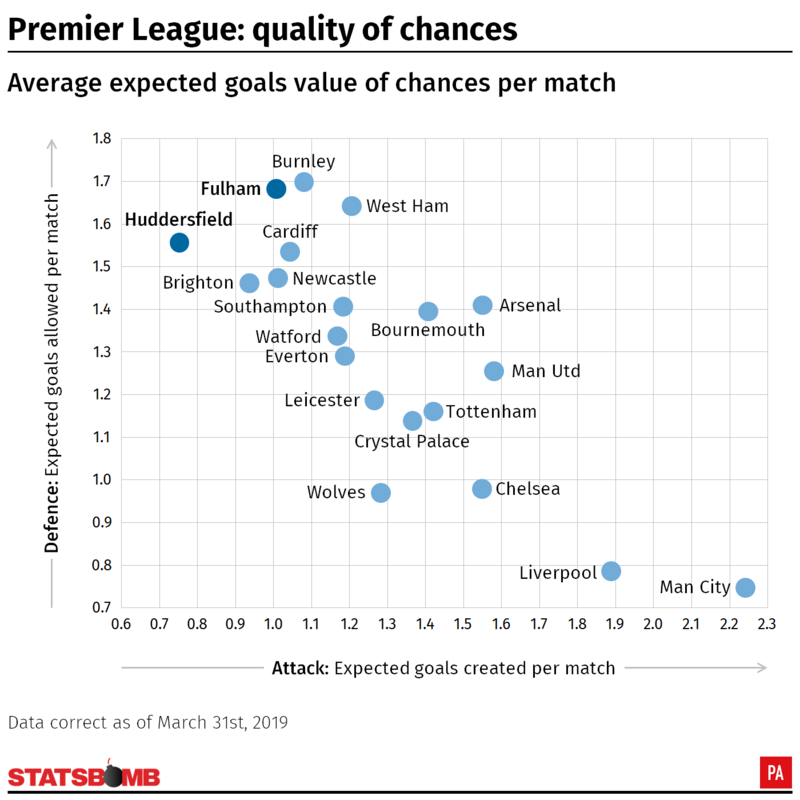 The Terriers’ lack of goal threat is the stand-out observation in that area of the chart – they are one of only two teams with less than one expected goal per match, averaging 0.75 to Brighton’s 0.94. Fulham are next in line with 1.01 xG per 90 minutes, and also have the second-worst defence in the league. They have conceded 1.68 xG per 90, a mark topped only by Burnley at 1.70. The Cottagers’ defence, though, has performed significantly worse than even those statistics would indicate – prior to facing Watford, they had conceded 72 goals in 32 games compared to 53.83 xG against. They had also scored only 29 compared to 32.25 xG. Huddersfield, meanwhile, have scored 18 and conceded 59 compared to an expected 24.08 for and 49.78 against (1.56 per 90). The data identifies Burnley as the likeliest team to fill the third relegation place, with 1.08 xG per game and that league-high xG against. Part of the reason for Huddersfield’s under-performance at the attacking end of the pitch is a scoreless season from striker Laurent Depoitre. StatsBomb’s figures show the Belgian has had 34 attempts at goal this season totalling 3.66 expected goals in his 1,068 minutes on the field – or 0.31 per 90 minutes, virtually a goal every three games had he started regularly. Steve Mounie has had almost 50 per cent more playing time and taken 52 shots but scored only twice, leaving January signing Karlan Grant and defender Mathias Jorgensen as Town’s joint-leading scorers with three goals each. 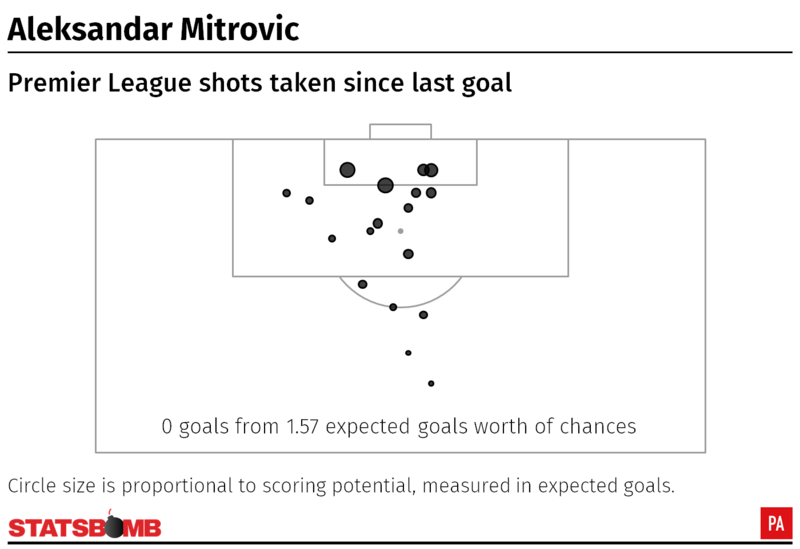 Fulham’s Aleksandar Mitrovic has been more successful, scoring 10 goals this season, but his two-month drought has played its part in ushering the Cottagers towards the trapdoor. The Serbia target man went into the Watford game on a run of seven games without scoring since his last goals on January 29 – a brace against Brighton. He had played the full 90 minutes in each of those games, taking 18 shots worth a total of 1.57 xG without success.